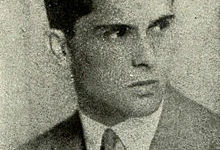 First an extra, Henri Chomette became the assistant to the directors Jacques de Baroncelli, Robert Boudrioz and Jacques Feyder. Throughout his life, Henri Chomette lived in the shadow of his brother René Clair, which earned him the nickname "clair-obscur". Very early on, he broke with the teaching of his teachers and participated in the avant-garde movement by building a theory of "pure cinema", which gave great importance to the cutting and editing of scenes. This theory is illustrated by three silent short films: "Jeux des reflets et de la vitesse" (1923), "A quoi rêvent les jeunes filles? " (1924) and "Cinq minutes de cinéma pur" (1925). While his brother obtained his first success with "Un chapeau de paille d'Italie", Henri Chomette struggled with the comedy "Le chauffeur de mademoiselle" (1927). However, he definitively turned away from his theoretical concerns from Requin (1930). Resolutely anti-Semitic, he will soon only shoot for the cinema of the armies and dies in general indifference in Morocco. "Chomette's works are not like the symphonic movements of Ruttmann or Gance. A few agreements are enough to express a vision of the world through cinema and show the cinema itself. (Prosper Hillairet in L'art du mouvement, édition Centre Pompidou, 1996, Paris, p.99).